I will keep this post short. I know that so many of you are busy. Almost everyone I know who celebrates Christmas is in a whirlwind of last minute preparations. Just one more room to clean before the relatives arrive. Just one or two more decorations to hang. 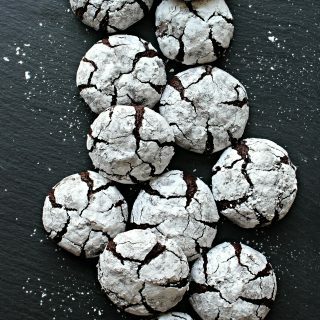 Just a few more cookies to bake or confections to whip up. Just one more gift to buy and wrap. Kindnesses to bestow and joy to create. 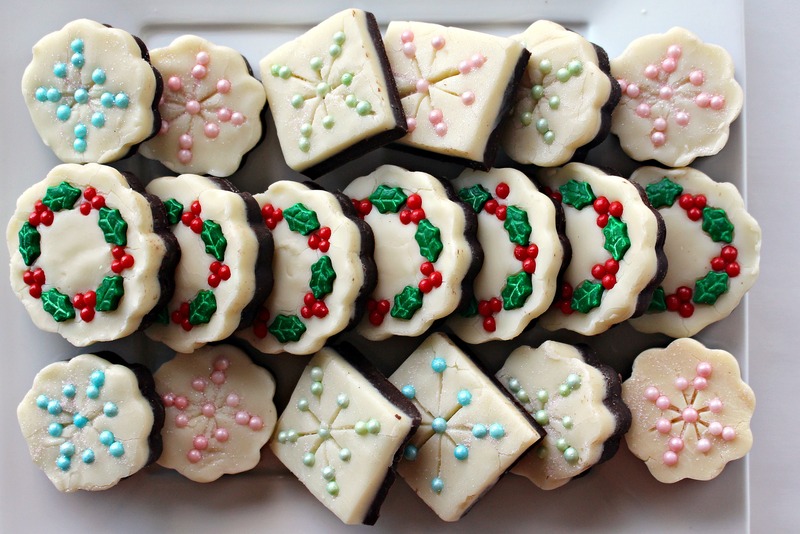 Snowflake and Wreath fudge is the perfect last minute entry to the festivities. 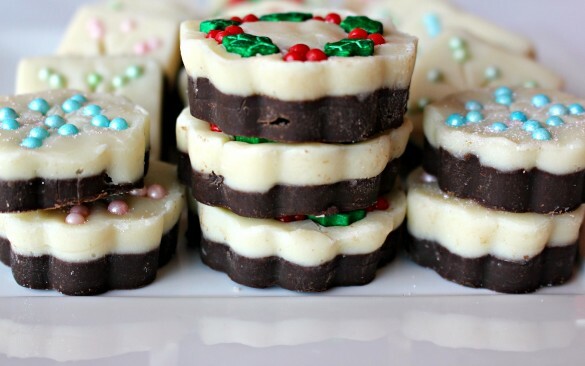 This fudge cooks up quickly with only three ingredients and some sprinkles. 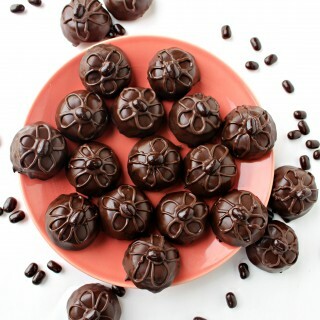 The creamy chocolate flavor ensures that this fudge will disappear quickly from holiday trays. The festive designs make it an impressive gift to deliver in person or to mail. 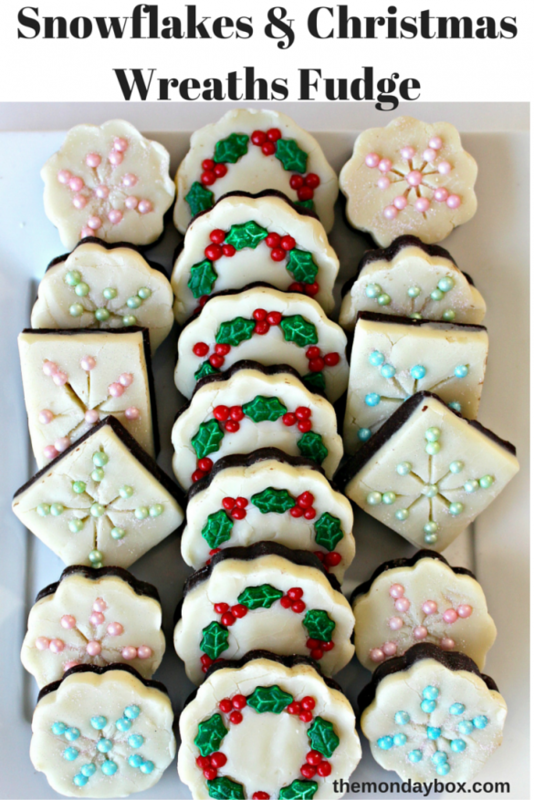 When I started making this fudge, I used cookie cutters to form the circles of fudge for the wreaths and snowflakes. It is relatively quick to do, and I was enjoying sampling the scrap edges left over from the cut-outs. However, I know that when your to-do list is longer than there are hours in the day to accomplish it all, short cuts are appreciated. I tried cutting the fudge into squares, which is a quicker processes, and a more efficient use of the entire block of fudge (though sadly there were no more scrap edges). 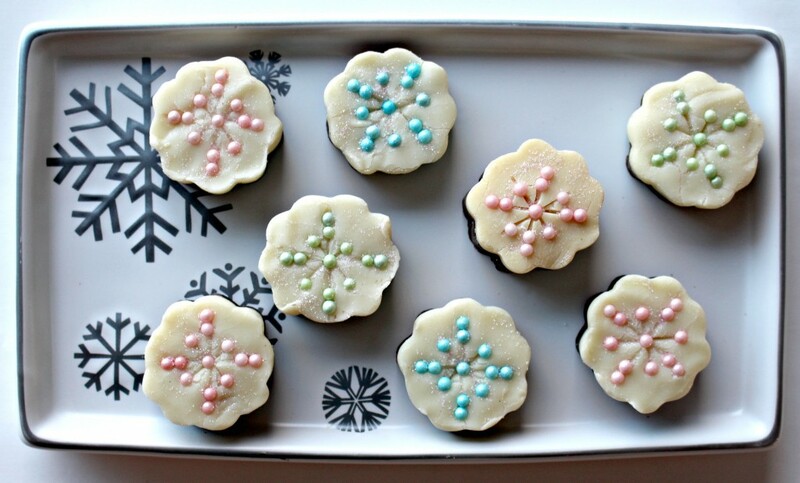 I think the snowflakes on the squares look just as pretty as the circles! Choose whichever shape you prefer. The ingredients are so basic, you probably have them already. 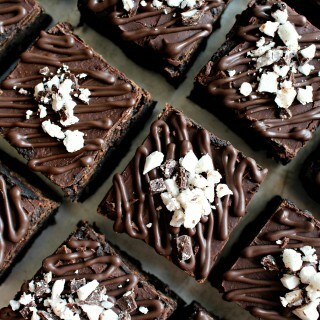 The chocolate you use may affect the softness of the fudge. 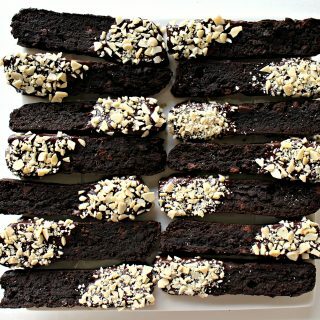 I like using chocolate melts (candy and molding formula) from Chocoley.com for the ease of smooth melting and the soft fudge that results. This recipe suggests using a double boiler to melt the chocolate because that is a gentler melting method. You are less likely to end up with over cooked chocolate if you stir continually over a double boiler than if you use the microwave. The sprinkles I used are easy to find, if you don’t have some already. 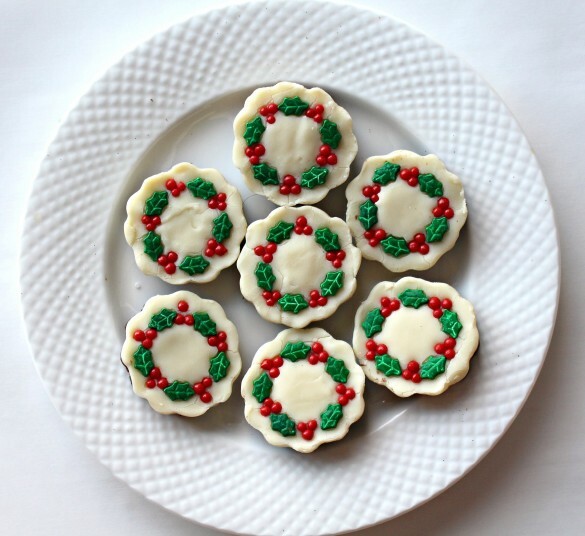 The wreaths are made with holly and berries sprinkles by Wilton. The snowflakes use nonpareils and luster dust that are part of a new line of baking products at World Market. A note about perfectionism. The softer the fudge, the less cracks will appear when the surface is cut or when sprinkles are added. However, even if some minimal cracks do occur, these little fudge shapes are still beautiful. No worries. 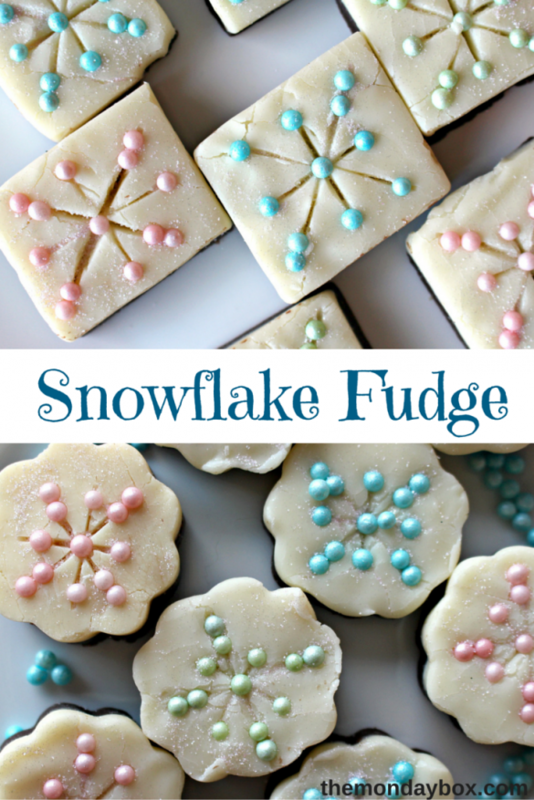 Share and enjoy some holiday sweetness with Snowflake and Christmas Wreath Fudge. My best wishes for a Merry Christmas full of peace, happiness, cookies, and chocolate! Line a 9”x9” baking pan with parchment paper. Place the semi-sweet chocolate and ½ can of condensed milk (1/2 cup plus 2 tablespoons) in the top of a double boiler over medium-low heat. Mix continually until smooth. Pour into the prepared baking pan and spread evenly. Refrigerate for 10-15 minutes to set slightly. 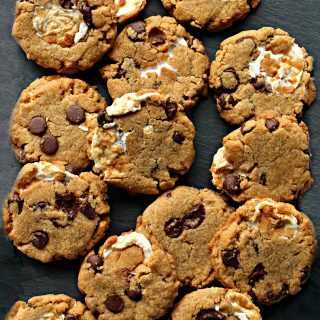 Place the white chocolate and the remaining ½ can of condensed milk (1/2 cup plus 2 tablespoons) in the top of a double boiler over medium-low heat. Mix continually until smooth. Pour over the semi-sweet layer and spread evenly. When the fudge is firm, remove from the refrigerator. 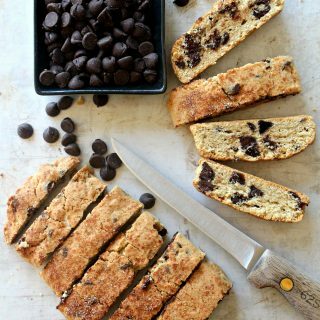 Use the overhanging parchment paper to lift the fudge out of the pan and onto a cutting board. 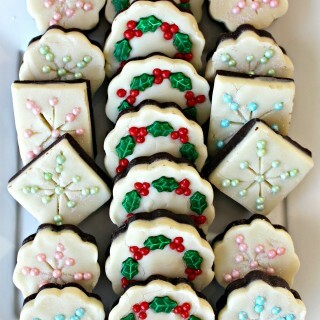 Cut into squares/rectangles with a knife or cut out circles with round cookie cutters. 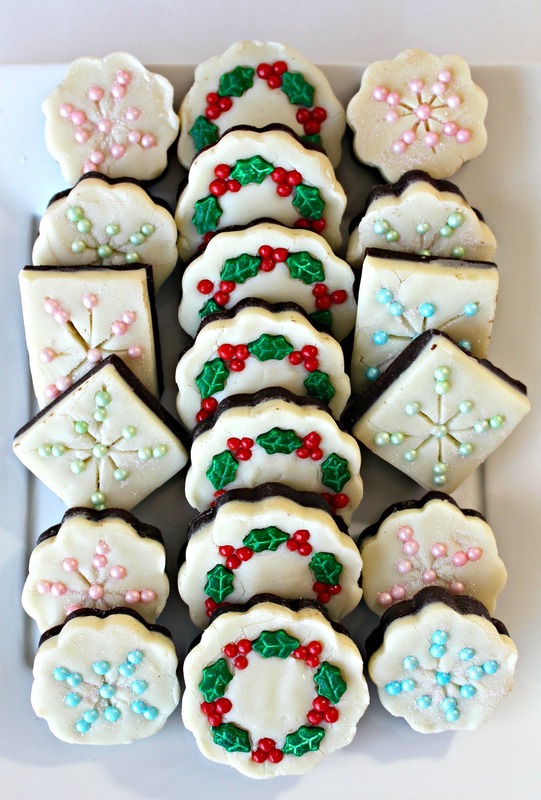 FOR WREATHES: Cut out the fudge with round cookie cutters. Gently press 5 holly leaf sprinkles in a circle on the surface of a fudge round. Leave space between the leaves for the holly berry sprinkles. Gently press three holly berry sprinkles in the spaces between the leaves. FOR SNOWFLAKES: Cut the fudge into squares/rectangles with a knife or into circles with a cookie cutter. 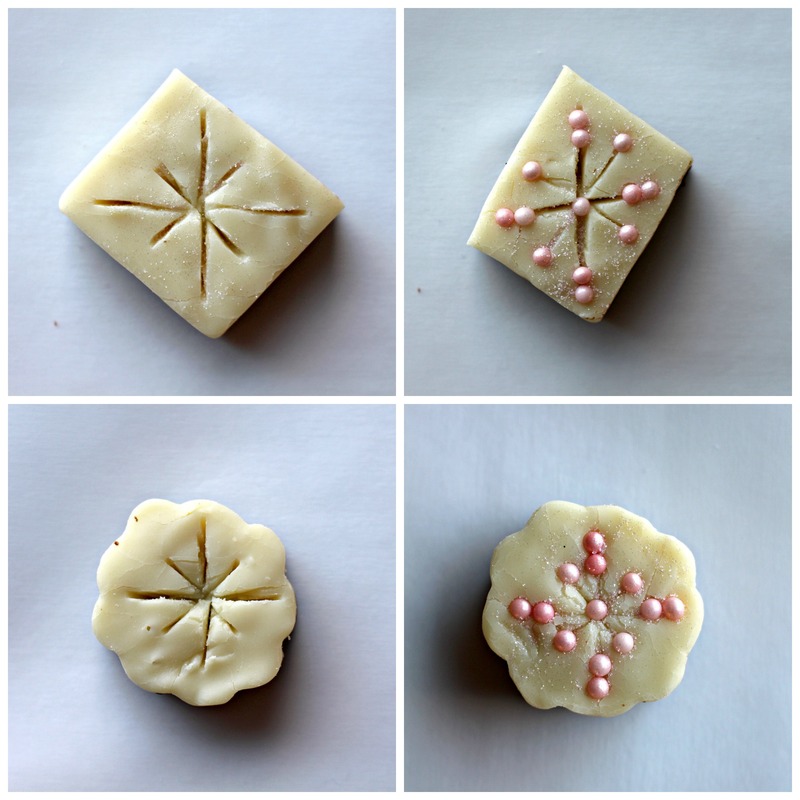 Use the rounded tip of an off-set spatula or butter knife to indent four lines in a crisscross star pattern on the surface of each fudge round or square/rectangle. Gently press nonpareil sprinkles into the ends of each indented line. Optional: Brush with luster dust. Store in an airtight container layered between sheets of wax paper at room temperature for up to 10 days. Layer fudge between sheets of wax paper in an airtight container or tin. Use crumpled wax paper at the top of the storage container to ensure no movement during shipping. Only mail fudge in cool weather. haha yup, I definitely feel like I am trying to do way too many things right now to get ready for Christmas!! This fudge is just gorgeous Wendy! I don’t know which I like better – they are just both so pretty! Thanks, Ashley! Good luck getting ready…or at the very least, I hope you have fun and enjoy the process. 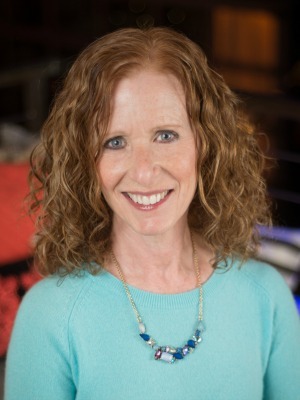 You are so good at creating stress free holiday strategies, my guess is that you have it under control. Perhaps your Santa Pup can help? These are so pretty Wendy! They would make a great hostess gift. Thanks for showing us how to make them! You have a lot more patience than I! I was so surprised to read that this was actually fudge. It’s such a unique presentation, so festive and the dual layers are another treat! Very creative and simple at the same time…the best kind of recipe! Happy holidays to you and yours, Wendy!! I can’t seem to leave “plain and delicious” as is! Apparently, I am I have a thing for upping the cute factor with sprinkles. It doesn’t change the flavor, just the curb appeal. 🙂 I am NOT making any more fudge for awhile. I found it impossible to leave alone! I hope you and your family have a magical Christmas, Monica! Thank you, Tricia! You are always so kind and supportive! These little fudge bites are so easy to make (especially the rectangle ones)and look rather “gift worthy”. 🙂 I hope you and your family have a wonderful Christmas! Love the fudge! So pretty! Thanks, Carrie! It tastes great too. Beautiful!!! I’m pinning this one! Thanks. 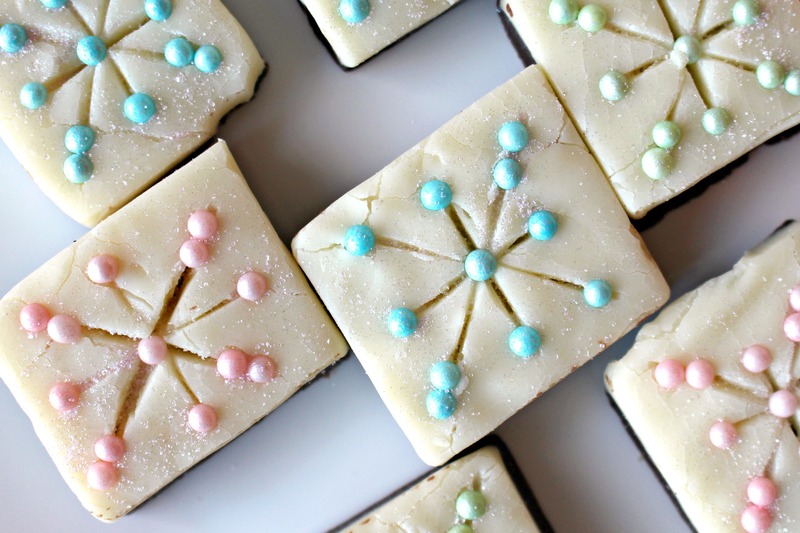 The fudge looks so pretty.. too pretty to eat, but I’m sure it tastes just as wonderful as it looks! Oh my gosh! Even your fudge is beautiful! Pinning this as well!